Chuck Meese of the Red Wing Theater passed away today. Chuck Meese was a musician, artist and a marvelously inventive actor. 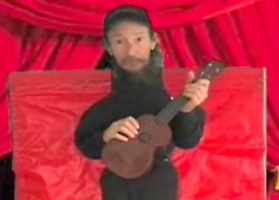 He had his own traveling theater and performed in many schools and fairs, often with his sons Cavan and/or Jan. Every summer he would perform at the Bread and Puppet Theater. His guitar playing and crankie stories are legendary. He had been ill for a long time and passed away on Sunday, May 20, 2012.